I'm going to crack on with this now. Sorry if this is the wrong place but I would love it if somebody could please do and home and away strip for me for my current save with Patro Eisden in the Belgium bottom division. Their home kit is purple and the white kit is away (with purple). Please be as inventive as you like but please stick to the purple and white colours and also please in the normal FM default style. I would really appreciate it. Thanks a lot! Excited to see what people can come up with! 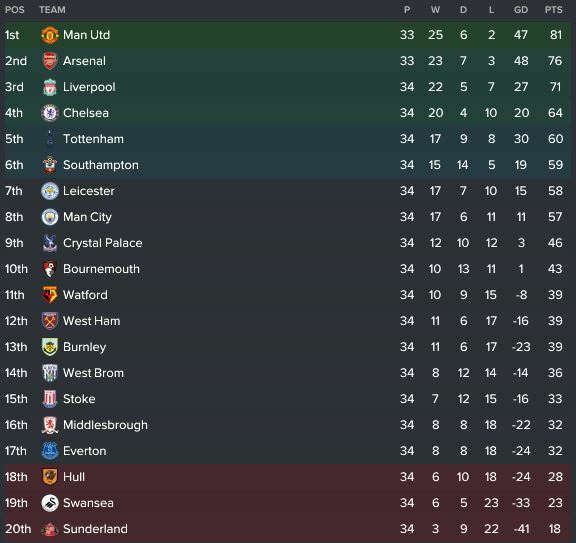 Ten games gone in the league and really happy with how we are doing. We are only three points off the Champions League places which I do not expect to finish anywhere near but it's been a pleasing first ten matches. The players seem to be getting used to my tactic and it's all going well so far. Madness to see Manchester City doing so poorly- cannot see Pep being there for much longer. Beat Maccabi at home and then travel to Voj and grab a win and we're through to the next round. I feel like we can definitely do it. Exciting times. 3rd November 2016 - Europa League - Group Stage. Starting XI: Adrian; Collins, Fonte, Ogbonna; Feghouli, Rice, Gunnarsson, Noble ©, Snodgrass; Calleri, Griffiths. Subs: Puggioni, Iorfa, Kouyate, Obiang, Tore, Ayew, Carroll. What a performance and what a win which takes us up to second in the league. We win our next two matches and we're in the next round. Simple. Fiorentina are a good side but we more than matched them. Jonathan Calleri played really well in the target man role and him and in-form man Leigh Griffiths both had great games. I gave Declan Rice his first start in professional football and he did well. Happy to see Andy Carroll back on the bench- cannot wait to see him when he's back to full fitness. Few more international call ups. Nice to see Josh Cullen being called up for Ireland under 21's. He's on loan for this season at Bradford in League One and is doing well there- he may be one to keep an eye on for next season. Feghouli has once again been left out of the Algeria squad- weird one as he's done quite well for me this season. Summer signing Dominic Iorfa has come third in the POTM for October. Really happy for the lad and he looks to be a brilliant addition to the squad. Jose Fonte is his tutor and he seems to be helping him massively. Within this career, I am looking to give youngsters a chance to impress. 17 year old Declan Rice has been performing brilliantly for the under 18's and has done really well in training so decided to give him a few minutes against Boro to give him his Premier League debut. I will be looking to bring through some more youngsters throughout the season. 29th October 2016 - Premier League - Matchday 10. Starting XI: Randolph; Collins, Fonte ©, Ogbonna; Feghouli*, Gunnarsson, Kouyate**, Obiang, Snodgrass; Sakho***, Griffiths. Subs: Adrian, Iorfa, Rice*, Nordtveit, Tore**, Ayew, Calleri***. Leigh Griffiths does it again! It looked like the game was heading for a draw until a crazy last ten minutes. Griffiths won the penalty and then brushed himself off to grab his first from the spot. Only one minute later he headed in from a corner. Patrick Bamford scored for Boro but we managed to hold on. We face Fiorentina next in the Europa League- revenge is on the cards! 26th October 2016 - EFL Cup - Fourth Round. Starting XI: Adrian; Iorfa, Fonte ©, Ogbonna; Ayew, Nordtveit, Kouyate, Obiang*, Snodgrass**; Sakho, Calleri. Subs: Randolph, Collins, Cresswell, Noble, Tore, Feghouli, Griffiths. Less said about this one the better. We played a somewhat weakened side but this just wasn't good enough. We need to be better in the league when we face Boro. Another injury which is a real shame, especially as it's to Fletcher. He's done well recently so I'll have to see what I can do up top. We have Sakho and Carroll still a few weeks away from full fitness and Antonio is also ruled out. 23rd October 2016 - Premier League - Matchday 9. Starting XI: Randolph; Iorfa, Fonte, Collins; Ayew*, Nordtveit, Kouyate, Noble ©, Snodgrass**; Fletcher***, Griffiths. Subs: Adrian, Ogbonna, Gunnarsson, Obiang, Tore*, Feghouli**, Calleri***. Not the best performance but a very good win against a poor Sunderland side. Made a few changes from the loss in the Europa League and we played well. Nice to see Leigh Griffiths grab the all important goal near the end of the game. I had a few reservations about him adapting to the Premier League but he's done really well. We have Arsenal next in the EFL Cup Fourth Road. Going to be a tough one. Another youngster will be joining us in January. Niall Ennis will join us from Championship side Wolves. He has great physical stats for a lad of only 17 years old- looking forward to see how this lad progresses. English too which is a bonus. 20th October 2016 - Europa League - Group Stage. Starting XI: Puggioni; Iorfa, Fonte, Ogbonna; Tore*, Gunnarsson, Obiang, Noble ©, Snodgrass**; Fletcher, Griffiths. Subs: Adrian, Collins, Nordtveit, Lanzini*, Ayew**, Feghouli, Calleri. We tried hard but it wasn't good enough- I always knew it would be a tough place to go. We were hit with two goals late in the first half which killed us. Griffiths found the scoresheet but we were hit on the break when we were pushing for the winner. Sunderland in the league up next. Dropped down to third in our group. Another player will be joining me come the 1st January and this time it's a goalkeeper. Like Vieira, this lad was brought to my attention through my scouts and he's somebody who I think could become a very good player. He is first choice in the Serie A with Palermo but he won't be first choice here. He's one for the future and I am excited to see how he develops. May look to loan him out to a Championship side for first team football. 15th October 2016 - Premier League - Matchday 8. Starting XI: Randolph; Iorfa, Fonte, Ogbonna; Tore*, Obiang**, Gunarsson, Noble ©, Snodgrass***; Fletcher, Griffiths. Subs: Spiegel, Collins, Arbeloa, Cresswell*, Feghouli**, Lanzini***, Calleri. What a win. I made a whole host of changes from the loss against Swansea and it worked wonders. We were never expected to win this game but were definitely value for the three points with a great away performance. We only managed 39% possession but we hit City perfectly on the counter three times to come away with a fantastic away win. Over the moon. Europa League up next- confidence is high. Frustrating to see Antonio injured again as he's done well this season. Thankfully it's not too bad and he should be back within a month. Time for Ashley Fletcher to stake a claim for his place against Manchester City. Lanzini kicking off again. I felt sorry for him before but he's really starting to annoy me now. I've given him chances in the Europa League and the EFL Cup but he hasn't delivered. I've offered him out but nobody is interested. Will look to ship him out 100% in January- for now, he'll just have to get on with it. 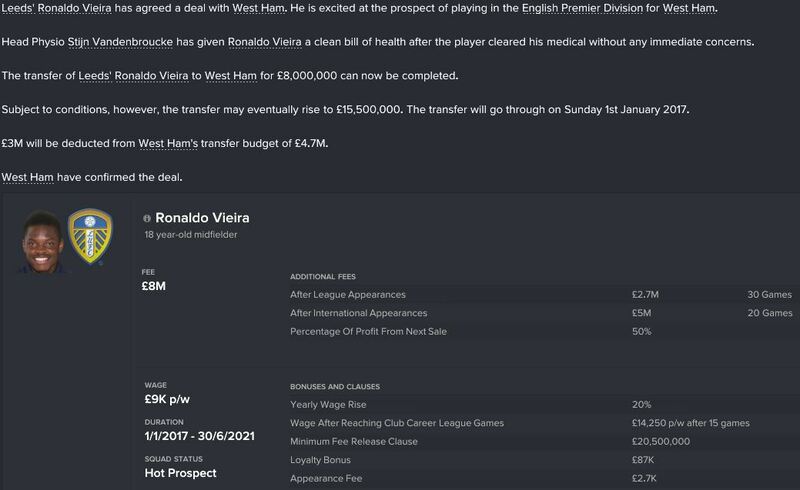 He's one of my highest paid players on £70k a week so will be nice to get him off the wage bill. 2nd October 2016 - Premier League - Matchday 7. Starting XI: Randolph; Iorfa, Fonte, Ogbonna; Feghouli, Nordtveit, Kouyate, Noble ©, Snodgrass; Antonio, Griffiths*. Subs: Puggioni, Collins, Gunnarsson*, Tore, Lanzini, Calleri, Fletcher. 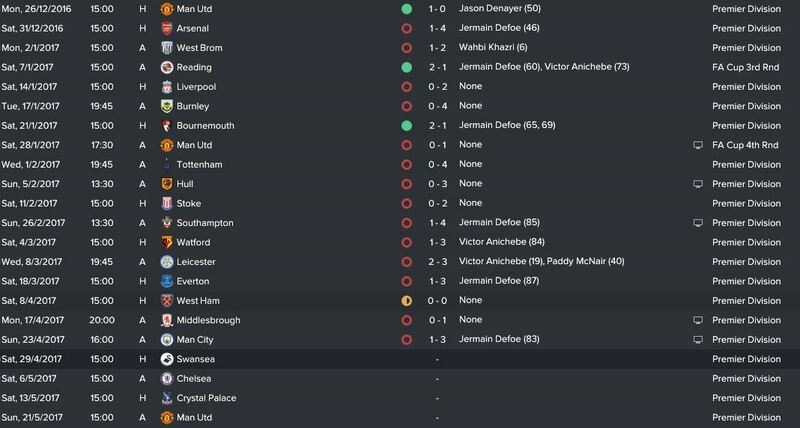 After such a good result in the Europa League in midweek, for some reason my team just didn't show up for this one. We were battered from start to finish and probably deserved to lose by much more. Kouyate got himself sent off for the second successive game. All in all, crap day at the office. Manchester City up next where we need to do much, much better. When I started this career, I outlined my ambition that I am looking to bring in young players and turn them into Premier League standard. Dominic Iorfa has been given a chance of first team football since his arrival from Wolves and has done fantastically- his form has even earned him call ups to the England under 21 side. I have sent scouts all over the world and look at their reports on a weekly basis to see if any players catch my eye. Using that philosophy, that is how this young man was found. 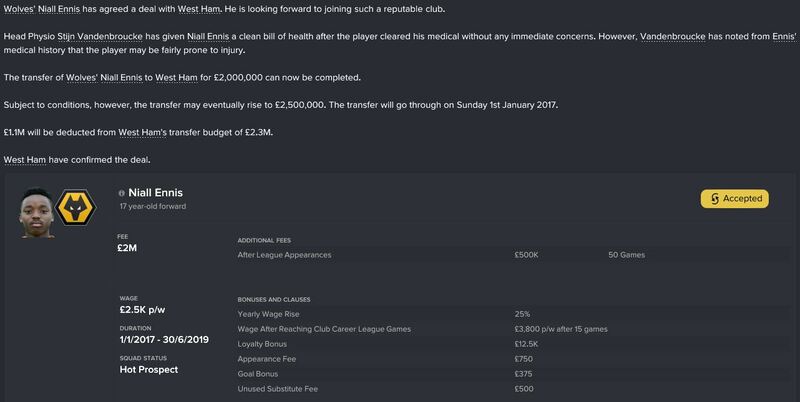 After some tough negotiations, Ronaldo Vieira will join us on 1st January 2017 for a fee which could rise to £15.5 million. Much of that is through clauses, meaning only a small chunk comes out of my budget for now. I intend to put Mark Noble as his tutor and hope to see this lad improve massively when he joins us. He's not played any games for Leeds in the league below this season so obviously spending such a large amount of money is a risk but I am confident it will pay off. 29th September 2016 - Europa League - Group Stage. Starting XI: Puggioni; Iorfa, Fonte, Ogbonna; Feghouli*, Gunnarsson, Kouyate, Noble ©, Lanzini**; Antonio***, Griffiths. Subs: Nordtveit, Collins, Obiang, Tore*, Snodgrass**, Calleri, Fletcher***. Slightly rotated the team from our win against Everton for our tough away match in Israel. All in all, really happy to get a point especially after Kouyate was sent off for two bookable offences. Always knew it would be a tough place to go so to get a point with a much rotated side- very happy. 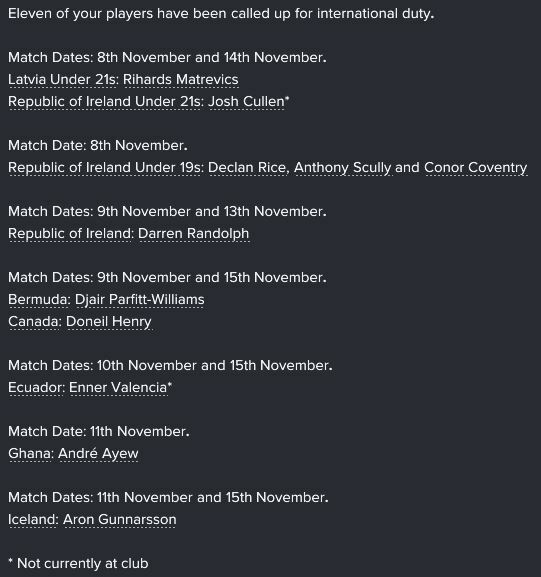 Nice to see a large number of my lad's get called up for international duty. Hopefully not too long until Michail Antonio's form gets noticed and he manages a call up. 24th September 2016 - Premier League - Matchday 6. Starting XI: Randolph; Iorfa, Fonte, Ogbonna; Feghouli, Nordtveit, Kouyate, Noble ©*, Snodgrass**; Antonio, Calleri***. Subs: Spiegel, Collins, Obiang*, Tore, Lanzini**,Griffiths***, Fletcher. 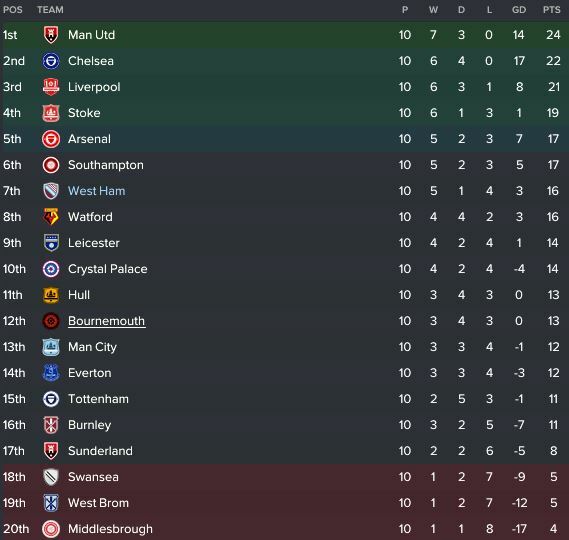 Despite Ipswich taking us to penalties in our last match, I decided to keep pretty much the same team. Manuel Lanzini was the only man to drop out of the starting 11 with Robert Snodgrass coming in to replace him. At the start of this season, I was worried that we would struggle without a target man, especially as it's a big way of how I play. However, Michail Antonio has really come into his own in that position and had a great game, managing to bag his sixth goal of the season. Snodgrass had a stormer too and Everton couldn't handle us. Disappointing to throw away the clean sheet late on but happy with the win. Tough trip to Israel next as we face Maccabi in the Europa League. Absolutely gutted for the lad. Sam Bryam has been ruled out for nearly a year with a terrible knee injury. He is currently on loan at Swansea but I am going to recall him now after this horrendous injury. He was sent out on loan to Swansea to get some gametime but unfortunately for him, he won't realistically play again until next season. He's young so has time to recover, I just hope it doesn't harm his potential. Starting XI: Randolph; Iorfa, Fonte, Ogbonna; Feghouli*, Nordtveit, Noble ©, Kouyate, Lanzini; Antonio**, Calleri***. Subs: Spiegel, Collins, Obiang, Tore*, Snodgrass, Griffiths**, Fletcher***. Went with a very strong side for this EFL match with only one change from the draw with Spurs. Lanzini started on the left ahead of Snodgrass and failed to adapt to his position on the left wing. Nice to win on penalties but disappointing that Ipswich managed to take us that far. Hope my players aren't too tired for the match against Everton at the weekend. It's a shame because I know what a good player he is- he just doesn't fit into my system. I played with a BWM in the middle and two CDM's so Lanzini just doesn't fit into my side. 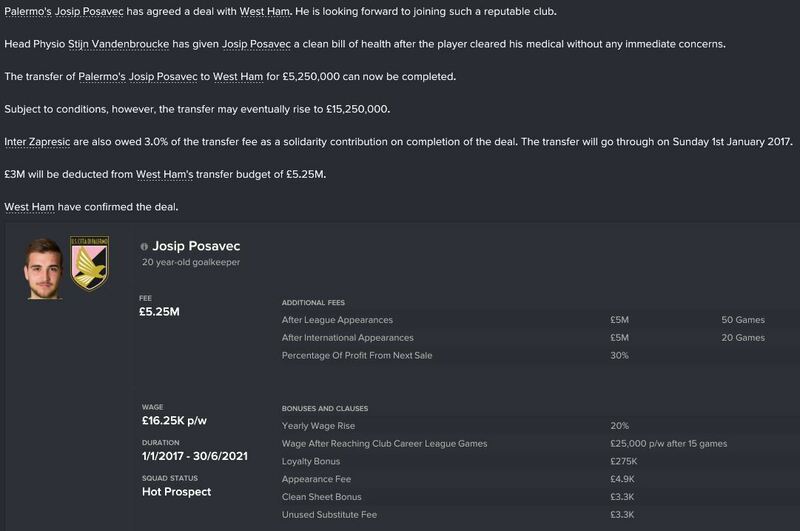 I am trying to re-train him as a winger but even then, I have Snodgrass and Feghouli who are my starting wingers. I tried to offer him out but nobody wanted him- I'll re-assess in January. 18th September 2016 - Premier League - Matchday 5. Starting XI: Randolph; Iorfa, Fonte, Ogbonna; Feghouli*, Nordtveit, Kouyate, Noble ©, Snodgrass; Antonio**, Calleri***. Subs: Spiegel, Collins, Gunnarsson, Tore, Lanzini*, Griffiths**, Fletcher***. Made a whole host of changes from our win in the Europa League to face a strong Tottenham side. Going into the game, I would of been happy with a draw but I can't help but be disappointed with the result. We played really well and went ahead through Calleri but Spurs scored late on to head home with a point. We face Ipswich next in the EFL Cup- will probably played a rotated side for that one. Starting XI: Puggioni; Iorfa, Fonte ©, Ogbonna; Tore, Gunnarsson*, Kouyate, Obiang, Snodgrass**; Fletcher, Calleri. Subs: Masuaku*, Collins, Nordtveit**, Lanzini, Feghouli, Antonio, Griffiths. First Europa League group game ended with a convincing win. We face Spurs in our next match so I decided to play a much rotated squad and in all honesty, we battered them from start to finish. Nice to see Ashley Fletcher getting a goal. Will look to play some of my youngsters in the Europa League this season. 11th September 2016 - Premier League - Matchday 4. Starting XI: Puggioni; Kouyate, Fonte, Ogbonna; Feghouli, Nordtveit, Obiang, Noble ©, Snodgrass; Fletcher, Calleri*. Subs: Spiegel*, Iorfa, Tore, Lanzini, Gunnarsson, Griffiths*. West Brom is always a tough place to go but this performance was unacceptable. Yes, we've had a few injuries but it just wasn't good enough. We got battered throughout and deserved to lose. Ashley Fletcher was given the chance to replace Antonio but didn't really step up. Need to move on from this and quickly. Europa League up next.